If you're in the mood for a patio makeover, you might consider adding a vertical garden to your outdoor space. They allow you to express your green thumb and build your own easy-to-care-for backyard mini-garden at the same time. Both gardens are easily created by the average DIY type. If you think there's no room for a garden in your small backyard, think again. Vertical gardens take up very little space and are the perfect addition to your patio. These work best when set up against a wall or fence. Go rustic with pallets, or use bricks or cement blocks for a more contemporary look. 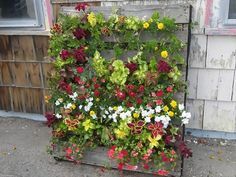 The pallet garden is made by covering the sides, bottom and back of the pallet. Lay it out flat, add soil, starter plants, water and let it sit for a week or so until the plants are established. Then mount the pallet on your wall or fence. Alternatively, you can just lean it against a vertical surface. These pallets are watered from the top down. Gravity will pull the liquid to the bottom of the pallet, so be sure you don't over-water and drown the plants. Different colour pansies work well with these walls, as do daisies. One way to pull off the cement block idea is to layer the blocks and leave gaps in between. Think of a checkerboard, where the red and black squares alternate and one row is the opposite of the next. The black squares are the blocks; the red squares are the gaps. For your wall you'd need rectangular blocks so the edges of one row can sit on the blocks below. For visual interest, you can set some of the blocks crosswise. The weight of the blocks will eliminate the need for cement, but you will need at least two people to balance the blocks when they are being set up. Once finished, put small pots with flowers in each open spot. Add more flower pots along the top of your wall. The beauty of this wall is you can change the flower pots whenever you wish. Water the old fashioned way using a sprinkling can, or use a hose with a spray attachment to give the plants a nice shower. You aren't limited to flowers. If you live in an arid area, put in pots of succulents. Or, create an impressive herb garden right outside your backdoor. For more information or advice, contact a company such as Lifestyle Patios.